One of my biggest pet peeves of Google News search has long been the search engine's inability to recognize if a story had already been tracked, spawning new "alerts" every hour, while the content stayed the same - the only difference being the story registered as having been posted "five hours ago" versus "four hours ago", "three hours ago", et cetera. Now, in a quiet upgrade today, it looks like Google has heard our cries and eliminated the issue once and for all. The second option, without duplicates, replaces the previous version, which showed all duplicates. It, in turn slid over to the right, as the third option. A quick search for Global Warming, a hot topic at Google these days, easily demonstrates the power of the new filter. Under the old system, it would spawn 34,065 results. With the deduplication filter applied, that number is slashed in half, to 17,247. And in case you think that's an isolated case, here are some more searches, before and after. * Apple: 17,568 with the filter, and 30,419 without. * Intel: 6,411 with the filter, and 12,783 without. * Microsoft: 20,897 with the filter, and 40,847 without. Looks like a fairly standard 2 to 1 reduction, across the board. Looking at current events, or "real news", how does the new filter work? * Virginia Tech: 35,325 with the filter, and 82,270 without. * Freeway Collapse: 234 with the filter, and 1,640 without. * Golden State Warriors: 1,959 with the filter, and 8,182 without. There, the ratio is even more dramatic, anywhere from 3 to 8 times. As I rely on Google News searches to keep me on top of my company and its competitors, and have imported these news searches into my RSS feeds in Google Reader, the deduplication effort by Google is much anticipated and appreciated. Even if Google wants to find and manage all the world's information, they know the value of reducing the noise. To hear today's broadband-addicted geeks talk (er... type), you would think we could replace the nation's 9-1-1 emergency system with an intelligent mashup of Twitter, Instant Messaging, Blogging and RSS feeds. Some expect that in a time of crisis, if the nation's telephone systems are overloaded, that the Web would step in to save the day. But tonight, hours of sluggish Web access, which more closely resembled a Web abscess, only further highlighted to me that we have a long way to go before thinking we've got the ultimate answer. Around 9 or so this evening, despite having full range of our wireless Internet here at home, I couldn't check e-mail, log on to the company network via VPN, or even load Web sites. Safari would tell me "4 of 15 items" had loaded, and the progress bar would stall. Doubting my wireless, I connected directly via Ethernet to our cable modem, and again, had no success. I even tried to connect to the open WiFi networks from our neighbors, and those that have acted as backups in the past weren't there to save me now. And it turns out I wasn't the only one seeing issues. Not only was my wife's laptop not getting through, but via BlackBerry, I learned other colleagues were seeing similar slowdowns at their homes, as we all commiserated, complaining we couldn't pass over needed reports. Now nearly four hours later, I still can't log in from my home network, directly connected or otherwise, but did finally find a network which is letting me perform the basics - finally send an abbreviated update, catch up on Google Reader, check my standings on Ballhype, and synchronize all e-mail. A quick scan of Google News on e-mail and Web outages didn't find any results. It could be the issues were too localized to be news, or we have set such a low standard that nobody even finds such failures, whether from Comcast or AT&T or other providers, to be newsworthy. The Internet has become such a lifeline for communication for work, friends, family and news that to cut it off or slow down access would have dramatic economic and social impact. It drives me completely batty when there are any delays at all. So while we may all murmur about how real-world traffic will be impacted by last night's truck explosion in the East Bay, and discuss alternatives, here in the Web world, we're not that much better prepared. This network is not redundant, and a single accident, intentional or otherwise, could leave us in the dark. I had a taste of that this evening, and that was enough. Engadget's Ryan Block asks the question today. "Is Engadget’s daily wall-to-wall coverage too much of a good thing?" Are subscribers to the Engadget feed, who can anticipate upwards of 30 new stories a day, inundated by having too much to read, some of which might not find their fancy? The issue is a very real one for us on the bleeding edge of information consumption. For those of us RSS wonks who have upwards of 100 or so individual feeds, finding the time to read hundreds of posts on all topics can be a demanding task. I consistently scroll through 500 or so articles on Google Reader every weekday, and about half that number on the weekend. Engadget is one of the most prolific blogs, usurping even ESPN.com's main feed. According to my Google Reader Trends, Engadget posted 28.3 items per day over the last 30 days. Of those 848 items, I read 100% of them. Only an aggregate newsfeed I developed for work was more busy, tagging me with new items 42.7 times a day. The other mega-feeds? ESPN.com with 26.8 items, TechMeme with 22.8, Slashdot with 20.4, Eschaton with 18.5, Talking Points Memo with 15.2, Daily Kos with 14.6, and Mashable with 14.4 posts daily. Combined, those alone tally more than 200 posts a day, good for 40% of my reading. But in terms of quality over quantity, Engadget is among the very best. I've considered unsubscribing from Slashdot, which seems to lag Digg or Engadget these days. I actually did unsubscribe from Boing Boing a few weeks ago because the signal to noise ratio was too high. I've also considered reducing my political feeds like Eschaton and Talking Points Memo, which tend to be duplicates or feature too many "New Open Thread" type posts that don't add value to the RSS reader. As Ryan asks what the solution is, I would argue that in Engadget's case, it's not to write less through reducing the amount of posts that are accepted. Instead, it's to better let readers know that reduced sets of feeds are available on specific topics. Engadget, like ESPN.com and other busy sites, offers the ability to subscribe to channels dedicated to Gaming, HDTV, Storage or Wireless, for example. Rather than get all 30 stories a day, the focused reader would get 2 to 10. It's not about reducing options, it's about being a smarter consumer. I see the onus to be on the reader to better maintain their consumption of news than it is on the newsmaker to reduce their output. In the world of massive information, we as consumers should get ever more adept about how we get our news, and how we share it. So Ryan, don't worry about us being forced to read too much. Let us make the hard decisions, and you keep focused on bringing the news. As Oakland A's partial season ticket holders, my wife Kristine and I have seen more than our fair share of excellent baseball games - from Marco Scutaro's walkoff 3-run home run against the Yankees a few weeks ago to Huston Street striking out the Giants' Barry Bonds to close out the 9th inning last season, and many more nail biters. Today's game was quite different, in that for once, the A's posted a significant early lead, and held on to it to collect the win. We even managed to get to the game early enough to collect a pair of bobbleheads featuring A's gold glove third baseman, Eric Chavez. The A's early 2007 season can be characterized as being short on offense, by both teams. The A's haven't scored much, and their starting pitchers have been lights out. Today, only of those things was true. Ace Danny Haren, leading the league in ERA, went 7 1/3 innings, and saw his team pound out six runs in the first, at one point leading the Devil Rays by a 12-2 margin, on the back of three run home runs by rookie Travis Buck in the 1st inning, and later, the aforementioned Chavez, who managed to sneak a long poke fair after two close calls that ended up being long strikes. While the bullpen stretched out the final score to a 12-5 victory, the 26,000+ of us in attendance could relax, enjoy the 80 degree Spring weather and enjoy a comfortable A's win, which at times seems a rarity. The art of obtaining an A's bobblehead isn't much of a secret. Take the game's starting time (today it was 1:05 p.m.), subtract two to three hours, and make sure you get there on time. For us, we toddled in at 11:00 a.m., and found the line to get into the Coliseum stretched from the BART bridge down to the parking lot, and in a serpentine fashion, the line snaked up and back three times. A humble usher held a sign that said "End of Line" to let you know you really did have to go the end, and couldn't line jump to aid your chances. Though wary we would miss out, as we have before, we dutifully trudged to and fro until we were presented with the much-desired collectables. The Eric Chavez figurines now join other bobbleheads on our roster, including Haren, Frank Thomas and Nick Swisher. One of our new bobbleheads will be placed on the cubicle wall of my colleague, with whom I share a collection. Our devoted fandom was hardly out of order in today's crowd. Others had shown up hours before we had, placing down blankets, eating Krispy Kreme donuts or playing cards to pass the time before the lines opened. It may not have been the latest Star Wars premiere or video game console release, but the demand was certainly there. We were lucky to both get our bobbleheads and see a great game in great weather to boot. The only downside was coming in record proximity to grabbing a foul ball in the first inning that made its way to a 7 year-old two seats to my right. It's not really worth retelling, but I'll just say that I hope for my next opportunity, I'll be more prepared. LinkedIn is slowly but surely working to implement some of the more low-hanging fruit features I suggested the professional networking site adopt this last March (See: 10 More Suggestions for LinkedIn). After quickly knocking out a resume to PDF feature (#5 on the list), the company has now taken on the most public but integral feature (#10 on the list) by starting a corporate blog. In late March, Steve Ganz, head Web developer at LinkedIn, in a comment on this site, said the debut of the company's corporate blog was "imminent", and now that day has come. The company evangelist, Mario Sundar, joined LinkedIn just last month, but is ready to start promoting all things LinkedIn. His first post says, "If you’re looking for a singular information source on LinkedIn with regular updates on upcoming product features, tips-and-tricks, and events or if you’d just like to hear about all the fun stuff associated with working at LinkedIn, you have reached the right place." Congratulations to LinkedIn for offering a very-useful service and for continued growth. We appreciate the efforts and look forward to more progress. Don't forget, if you like louisgray.com, let's get LinkedIn! It's hard to know which posts are going to gain attention in the blogosphere, and which ones won't. Though I sometimes can call winners early, on occasion I am surprised. Sunday was one of those times, as a quick post I submitted on Google's Earth Day logo which featured the Google name as a melting iceberg was distributed throughout the Web, first landing on Robert Scoble's Link Blog, then on TechMeme, and eventually hit the front page of Digg, if only briefly. My observation that the company had subtly highlighted the crisis of global warming resulted in a wide range of comments here and on Digg, and multiple blog posts from supporters and detractors of the theory. All told, after seeing above-average traffic Sunday, Monday morning's traffic went from surge to explosion. Hitting the front page of Digg saw visitors pour into the site at the rate of 1,500 in one hour - quite the achievement for me, considering peak traffic to the site for a single day was previously less than 600 (That's what I get for being small potatoes). At one point, Sitemeter said that if the rate kept up, I'd be over 1 million individual visits in a 30-day period. By end of day, we ended up with just under 3,000 unique visitors, 98% or so who had come just to see the Google Earth Day logo story. And as is very common with visitors from Digg, they didn't stick around. Though my total RSS feed subscribers bumped from 54 to 62, there was no momentous surge. With the dust settled, we're almost back to normal here, staying under the fray. But in the wake of yesterday's traffic binge, you can see some of the conversations that emerged. IP Democracy: Has Google Taken a Stand on Global Warming? JD on EP: Google "Earth Day"
Any concerns I previously had about not meeting March 2007 traffic (See post: General Blog Direction: Up and to the Right) are now gone. Yesterday's spike put April ahead of March for good. Now I have to see if I can sustain the momentum. On Monday, I noted my two-year relationship with my 60 Gigabyte iPod had come to an end. I had moved on, ready to upgrade to the next version - even thinking about how cool it would be to have the new iPod Video and watch TV shows on the airplane. But before I made a trip over to Fry's or the nearest Apple Store, the iPod came back to life. Needless to say, I'm happy I don't have to shell out any dough in the near term, but on the downside, I kind of wanted to move forward. More details around how I managed to get the iPod back to life are covered in my latest post to The Apple Blog, titled iPod Death and Rebirth. Per agreement with them, I will not be cross-posting the piece, but instead, have provided a link. Enjoy. Ever want to try your hand at running the 2007 Oakland A's? Want to challenge a friend? Well, the ANtics have made it ever so easy! Simply find two player tokens (buttons and coins will do), a single six sided die, and some serious fandom, and you're on your way. 1) Roll the dice to see who goes first. Highest number leads off. 2) If you land on a square with instructions, follow those instructions. If you land on a photo, then bask in the glory that is A's baseball! 1) If you land in the special "Two Minute Thank You Speech" square, your opponent must time your speech and ensure it passes for you to advance. 2) If you land on the "Playoff Square", you're incredibly lucky! Roll high, and you can avoid the early rounds of the playoffs! 1) Unless you are advanced to a further series in the special "Playoffs Square", you must play all three rounds of the playoffs, provided your dice are lucky. For example, rolling a six does not get you to the World Series from the ALDS. It only guarantees you made the ALCS, but keep the momentum up! 1) The first player to advance and become World Champs wins. 2) If neither team makes it to World Champs, whomever goes further in the playoffs wins. What? You expected you had a 50/50 chance of wininng? What team have you been following? Want a full, high resolution copy you can play with at home? Download the 1 Megabyte PDF for your own enjoyment! Apple's iTunes "My Alerts" feature continues to bring me some great music from artists the service already knows I like, thanks to past purchases. My biggest limitations these days? Determining what to buy, and what to let go. But with $50 in new iTunes gift cards obtained from yesterday's belated birthday bash, I'm being a little more liberal in my tune acquisitions. Last night, I uncovered three new additions to the iTunes store: something new, something old and something blue, as the saying goes. DJ Tiesto's "Elements of Life". Released April 10th, this is DJ Tiesto's latest solo album that doesn't consist of his remixing other artists' tunes, following on to "In My Memory" and "Just Be". I've seen DJ Tiesto in concert, and was even briefly featured in a DVD called "Another Day at the Office", which included a Bay Area stop at Shoreline. Tiesto is easily the world's #1 DJ today, and I'm already enjoying the new tracks. iTunes listeners are calling it the "Best Trance Album of 2007", but... it's only April. Information Society: Peace and Love, Inc. This one debuted on iTunes on March 27, even though the CD itself debuted in 1992. Peace and Love Incorporated was one of my favorite albums in high school, and it died an antiquated death when I left cassette tapes behind, moving to CDs, MP3 and the iPod. Now, I'm all too tempted to pay iTunes for the privilege of going digital, to enjoy "Peace and Love, Inc.", "Crybaby", and "Where Would I Be Without IBM" again. An excellent album that brings back a ton of memories from high school. Eiffel 65: Contact Though Eiffel 65 is featured as a 1990s one-hit wonder, with their Blue (Ba Da Bee) song hitting the airwaves in 1999 and 2000, I actually didn't even find that track to be the best on the album. Instead, the album's leading song, Europop is the 15th most listened to song in my iTunes library, with 34 plays since iTunes started counting. Now, we've found an obscure follow-on album in 2001 and are enjoying the group's unique sound. It's not just weddings that can benefit from something new, something old, something blue. See if you can pull off the trifecta with your iTunes. With most families seeing April 8 as Easter Sunday this year, and my work-related travels taking me to San Diego this most recent week, today is the day my wife and I set aside to invite friends to our home for an Oakland A's themed birthday extravaganza. Now, with a few dozen expected to arrive in just over an hour, our house is decked out with all things baseball, the colors green and gold most heavily featured, of course. We have the A's vs. the Rangers playing on both TVs, in the living room and bedroom, a baseball themed birthday cake, green and gold napkins and plates, ballpark food, including polish dogs, peanuts, jelly beans and Skittles (green and yellow hand selected). We have all matter of A's paraphernalia out, from team blankets to pot holders and bobbleheads. Should be a fun time. I don't typically make a lot of noise around holidays and birthdays, especially my own, but the friends are arriving from all over. From the East Bay and the Peninsula, to lifelong pals driving up from the Los Angeles area, just for the event. As I told nearby neighbors, you will know the party is a success by what time the cops are called. But I was kidding. Or was I? You'll have to wait and see. This week's horrific shootings at Virginia Tech defy any in-depth analysis. Although the incident may eventually be more fully documented than any other in our nation's history, in part due to the killer's own use of the media, and vigilante student journalists' attempts to record it with their cell phone cameras or handheld video cameras, no amount of knowledge can let us understand why it happened, or what really could have been done to prevent it. While some look at the two hour gap between shootings and the police's inability to stop it a massive intelligence failure, I can't possibly hold the law enforcement liable. As I've mentioned a few times on this blog, for just over a year I was the full-time crime reporter for the UC Berkeley student newspaper, the Daily Californian. While most stories consisted of tracking the occasional assault and battery or in more fun times, a rash of vending machine thefts, I did have the occasional proximity to bloodshed. And in one incident off-campus, I was at the scene of a double homicide, whose perpetrator, as far as I know, was never found. That's where I look for some small parallel to the Virginia Tech massacre. To campus police, the shooter had taken two lives in an apparent domestic incident, and fled. While they were of course looking for him, there was no call to cancel classes or lock down the campus, in fear he had more violence in him. In the incident in Berkeley, there was no call to cancel classes or warn neighbors that the unfound gunman would strike them next. It was seen as a domestic incident, and nothing more. What separated the Virginia Tech incident from the one in Berkeley in the fall of 1997 was, of course, that the killer wasn't done killing. Not by a long shot. For a domestic dispute to balloon into one of mass murder and chaos is so incredibly rare, it's without shock that the shooter caught the entire university community unready for what had come next. And going forward, as there are more calls for police scrutiny, ramped up security and furor to avoid copycats or more bloodshed, it may all be for naught. We cannot predict the next move in the mind of a deranged killer, and we shouldn't expect our law enforcement to be super-human. Given everything they knew at Viriginia Tech, and their expectation they were dealing with a domestic dispute gone bad, we cannot blame the police or the university for what happened next, as horrible as it was. As easy as it is to find somebody to blame, there can only be one person - the one who pulled the trigger. It's not the police force or the university, or video games, or even the laws which let him purchase the guns. As they say, when there is a will, there is a way, and in this time of terror, his will was unstoppable. For the few of us who remained dedicated Sacramento Kings fans all the way through game 82, the season ended with a whimper. The Kings teased us with occasional strength, but ultimately drove us crazy and fell way short of expectations. Now, our only hope is that they somehow finagle an early pick in the upcoming draft and look to rebuild what is truthfully not a very good team. Until then, our friends at Ballhype are ready for the next stage: playoffs. The site is offering Ballhype users the option to choose the winners in each round of the NBA playoffs, just as is popular during March Madness with the NCAA college basketball tournament. Unlike the typical March Madness bracket however, Ballhype will allow you to change your picks after the series have started and give you more credit if you picked against the grain. The earlier you pick correctly, and the fewer the people who correctly selected as you did, the more points you get. Should be very interesting to see how this shakes out. As of today, my pick to win it all? Houston. Over the Cavaliers. I anticipate being wrong. Sign up for yourself at Ballhype. In order to outperform the market, it's a required element that you take a contrarian bent - either through buying into a stock early, shorting one at its apex before an eventual descent, or buying stocks on the cheap, if you feel they have been cut down to size unnecessarily, or by too much, effectively meaning you're betting on a near-term rebound. While I definitely subscribe to a buy and hold strategy for some stocks of reputable companies with serious short and long term upside, I have fallen victim at times by trying too hard to be a contrarian. So, given I had some available cash in eTrade, I added Yahoo! to my portfolio for the first time. If the stock regains half its one-day loss, I'll be up 5%. But, as sometimes happens, the first day's losses continue the next day or even further. Not only did yesterday's pummeling not include a late-day bounce, but Thursday's trading has seen Yahoo! go down an additional 2 1/2%, meaning instead of being up a few hundred bucks, I'm down a few hundred bucks, and I have to root for the stock to rebound just to break even, let alone make money. The question is, will I wait for Yahoo! to rebound, and make money, sell quickly to cut losses, or hold on until I lose even more? Those are the three choices. For now, I'm holding and waiting for an eventual retracing. In the summer of 2005, I did the unthinkable, and left my iPod, chock full of tunes, photos and company data, on an airplane, when traveling from Chicago to Baltimore. Not having backed up my data in a while, I was challenged to find out a way to rebuild and not lose anything important, and starting over, with a new iPod, took quite a bit of time. Not two years later, the newer iPod, a 60 gigabyte iPod Photo, has met a similar fate, once again having to do with air travel. This morning I flew from San Jose to San Diego, and upon reaching the hotel, plugged in the iPod to my laptop. After leaving the room for a few hours, I came back to find both the PowerBook and iPod were stuck in time. The seconds in my menubar weren't moving, and the iPod wasn't doing squat. While the iPod isn't lost, it is most definitely dead, offering up only a sad iPod icon, and asking me to contact Apple support. It won't mount on my laptop, or play music. Although I've been better about backing up since the first incident and did a full backup to my laptop a week ago, this is in no way convenient. The iPod has served as the best way for me to easily transport data from one location to another, serving as much more than a portable jukebox. Now, it's a paperweight. The question is, what to do next? Do I send it off to Apple to be repaired, uncertain as to when I'll get it back and for how much? Do I buy a new one, and junk the old one? Or do I stop with the iPod cycle and try something new? None of the options sounds cheap, and none is preferred to somehow magically fixing the one I've got, but here we are. Sigh. Wow! What a series! 3 games, 33 innings, 2 walk-off wins by the A's, and the continued heroics of a player known only as VMC. 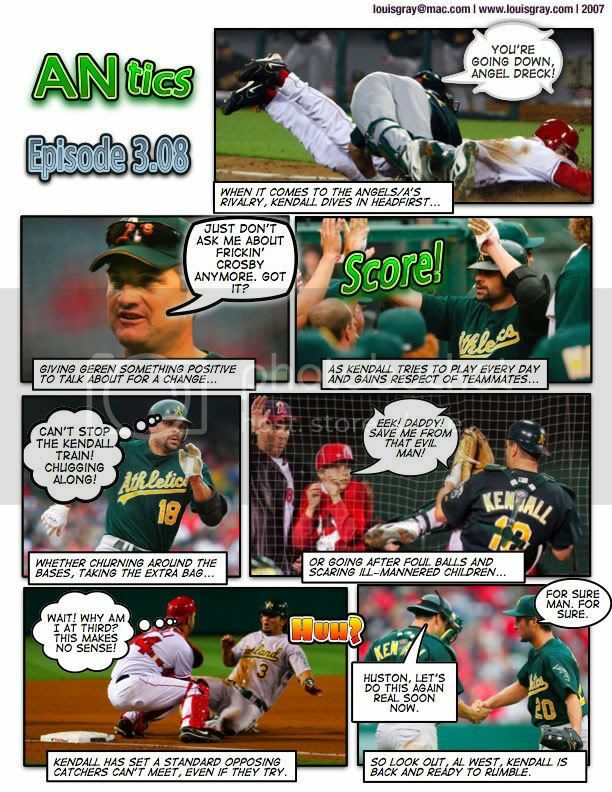 After an extended sabbatical, Joe Blanton and Adam Melhuse return to critique the three part series against the Yankees in the A's "This Week at the Movies". Let's make this clear. I have almost zero interest in owning my movies or TV shows. Unlike music, which I could listen to over and over until I had the lyrics memorized, TV shows and films have a very limited shelf life. It is a rare film that fills me with the need to see it more than once. TV shows are even worse. Outside of The Simpsons, once I have seen a show, I'm done with it. When I record shows on TiVo, I always delete the episode when I'm done. When I have watched TV shows I've purchased from the iTunes Store off my Apple TV, I delete them. Today, Apple announced that MGM has added its movie library to the iTunes Store, joining other Hollywood names like Paramount, Disney and Lions Gate. But when I go to the iTunes Store and shuffle through the offerings, I'm not buying. Not a single film. I am not going to pay $9.99 to $14.99 for a film that I will need to download and then watch once or twice at the most. But I most definitely would be happy to sign up and pay $20 or $30 a month to Apple for the privilege to download a set number of films per month, or of course, an unlimited number, even if Apple set restrictions such that I could only watch the downloaded films once or twice, or even tracked how many films I had downloaded, such that I didn't have too many "out" at one time - just like NetFlix does. Apple's iTunes application tracks how frequently I listen to my music, or if I have watched a TV show. The Apple TV knows to only synchronize those shows that are unwatched (i.e. Plays = 0). If we take this a logical step further, Apple could allow customers to download films, and once the play count reached 2, they would no longer be playable, either on the Apple TV or on my laptop. And yes, I know that one way to trick iTunes would be to stop watching the film before it had reached zero seconds remaining, but that goes back to Apple only allowing a set number out at one time. In Variety's coverage of the MGM announcement, they note that Apple isn't selling many movies online, and that the rate of adoption is hardly increasing. (Also: PaidContent's take). The company's online movie sales grew from 1.3 million from September to January, to 2 million-plus today. That's not much growth. Maybe the millions of people who have access to the iTunes Store, as I do, are happy with using NetFlix and that company's subscription model. Maybe it's a bandwidth issue. But regardless, they're not exactly jumping on it. How do you fix that problem? 1) Apple keeps DRM on iTunes movies. 2) Apple introduces a subscription model for iTunes movies. 3) Apple enhances the DRM to not play the file after a certain number (say 2) of plays. 4) Apple keeps the option to buy the films if you want, and at a reduced rate if you have already "rented" the film. I would do that. If Apple introduced this feature, I would cancel our NetFlix subscription tomorrow. The portability of iTunes via the laptop and the Apple TV is nearly as good as any DVD, doesn't require shipping, and won't force me to wait days from when I order off NetFlix to get my movie fix. Apple has all the tools - the DRM, the Media Store, the desktop application, the iPod and Apple TV media players. It just needs to look Hollywood in the eye, and give customers what they want. One of the most exciting things about blogging is finding how content is distributed in new ways. Through a single post, my content can be read on the blog directly, through RSS feeds, via e-mail summaries, and now, even by mobile phone, thanks to Feedblitz' new partnership with Twitter, announced today. While I'm no huge fan of Twitter so far, Feedblitz has, for more than a year, been a great way for me to update passive visitors to the blog, who can routinely expect updates on a daily basis, as the Feedblitz e-mail goes out anywhere from 11 to midnight, containing posts from louisgray.com from the last 24 hours. The e-mail comes to their mail box to be read at their leisure. Feedblitz is smart to extend its content distribution to subscribers who have let it known they would rather be updated through Twitter than by other methods. Additionally, Feedblitz has added an intelligent, necessary, twist. Rather than submitting the full content of my feeds to the Twitter customers, who often pay their mobile carrier by the character, Feedblitz offers recipients a fast summary, and then a "TinyURL" that links to the full story. TinyURL, quite simply, turns long URLs (e.g. www.domain.com/directory/date/topic/story_name.html) to "tiny URLs" (e.g. www.tinyurl.com/77apr08) This will save their customers money, and reduce potential barriers to entry. This in turn fits within Twitter's 140 character limit. As the Feedblitz site says, "Twitter syndication from FeedBlitz posts the relevant entries to the subscriber’s Twitter timeline as “tweets.” The subscriber can then get SMS text or IM alerts, as will anyone following that timeline." If you're a Twitterer, so to speak, and you want to stay updated on this blog, this just might be the holy grail. After years of thinking I was the younger one at church, at work, or in some social settings, I've come to realize that it's no longer true. The baseball players I watch on TV rarely have birthdates before mine. Many of the elite Web pioneers are around my age, making me realize that I could be lagging in my career trends, and not exactly leading the pack. But that's just part of my being ultra-competitive, and having highest expectations. Now, my next milestones start to look less like being a kid or a young adult, and more like numbers that represent different stages of life. 35. 40. 50. While taking up space in the 25-29 age bracket, I got married, changed titles at the company three times, all without changing jobs, moved twice, and racked up almost 200,000 frequent flier miles. Just some things that come to mind. From 30-34, what will change? Will we move and get a new house? Will the family be expanded? What will business look like compared to how it is now? I don't have a crystal ball. But the stake is in the ground. That's what 30 means to me. It's a signpost, marking one era of my life is now behind me, and we have to keep pushing forward, so when I do reach 35, 40, 50... I'll be pleased with what I accomplished. The A's, and much of Major League Baseball, had their first game on Monday, which just so happened to coincide with the last game of the college basketball season. Meanwhile, at the same time, the NBA and NHL seasons (clearly less important) are nearing their stretch drive for the playoffs. While continuing to ignore all the outlying sports (i.e. golf, tennis and all things racing, wrestling or winter), one could keep themselves quite busy by trying to stay on top of the sports world at large. That's why I have a somewhat clear prioritization of my sports consumption, accounting for pure fanaticism of teams, importance of games, and the sports themselves. Clearly the holy grail. My lifelong favorite team playing on the big stage. 1a and 1b would be other playoff games involving the Oakland A's. Again, the national stage, rooting for the blue and gold. 2a would be a bowl game with the Cal Bears football team. This is exciting stuff. Kicking off the season knowing you can follow the teams day in and day out the rest of the way. Also, at this point, all teams have a chance to win it all. I don't have a preferred football team, honestly. I rooted for the San Francisco 49ers as a kid, but that time is long gone. Still, the spectacle of the Super Bowl is unmatched. It's a storied rivalry 100+ years in the making. Cal has the axe and intends to keep it. I can skip this process this year. The Kings are horrible. That will reduce conflict with baseball now, I guess. Only if the Yankees are playing does it really diminish the game, but baseball's the best sport, and each game marks history. I will watch any A's game, regardless of their record, over the playoffs of most leagues. Baseball and the A's are simply superior. We've had season tickets for the last three years. The tradition. The band. Oski. Go Bears! Track and Field events in the Olympics can be dramatic. Heck, even gymnastics can keep you riveted for every one-tenth of a point, or in rooting for the random Romanian to take a header off the beam. On the flip side, there are a ton of events that could go away and nobody would notice. There's something exciting about the buildup of 65 teams fighting for a single championship, winner takes all. There's something wrong with me. For some reason, I still root for this team. I'd rather listen to the radio play by play of the Marlins vs. Phillies than watch the NHL ever, the NFL or NBA on most nights. Insert here: The NBA Playoffs, random NFL Sunday contests, the occasional Cal basketball match, San Jose Sharks games in person. So that's the priority list. If established, and acted upon correctly, if there are multiple games on at once, you know where you can find me. If it's A's baseball, I'll be there, with very few exceptions. But my loyalty to the Cal Golden Bears and Sacramento Kings isn't far behind. That's why you can find me on almost any night on Athletics Nation, Sactown Royalty, or making my picks on BallHype. Spring and summer were made for sports, and the action is heating up. Apple introduced new professional tower desktops this week, featuring quad-core Intel Xeon chips, which in their marketing world counts as eight cores, when you have dual chips thrown in. But while I'm not in the market to get a new computer, and if I were, it would be a laptop, it's always fun to jump into the Apple store and spec out a jaw-dropping rig. For just under 20 thousand bucks, I could get a top of the line Power Mac "with everything on it", including 3 terabytes of storage, dual 30" flat panel HD displays, 16 gigabytes of RAM, two 16x CD and DVD burners, a wireless keyboard and mouse, and the dual 3 gigahertz CPUs. Can't forget those. The best part? Apple offers free shipping. That just might be worth it. Right? David Sifry, CEO for Technorati, the Web's leading resource for blog statistics, searching and tagging, offers up an excellent case study for transparency for companies immersed in the world of Web 2.0. After I had guessed earlier this week that Technorati was going after spam blogs and later, that the company was about to give an update to the "State of the Blogosphere" or "State of the Live Web", no less than Sifry came here to confirm that was indeed the case. He even posted a comment letting me know when it was published. Yet, rumors continued to swirl around the company, saying that Technorati was either up for sale, or that he would be leaving the CEO role. Today, he wrote on his blog that Technorati was indeed looking for a new CEO. Earlier this week on louisgray.com, David wrote, "I'm not going anywhere, I'm very very happy at Technorati!!! ", to a commentor who suggested his departure was imminent. He again today said "I have no intention of leaving," and in his version of events, says that it was he who approached the company's board with the idea to change roles. While it's not too uncommon to see early founders change roles as companies grow, it is less common to have that change initiated by the founder themselves, so its possible the board and others had been exerting pressure, but of course, I have absolutely zero insight there. In the Web space, customers care a lot more about products, services, functionality and integration than they do the individuals pulling the levers and writing the code. Kevin Rose at Digg is a great name and icon for his company, Mena and Ben Trott do the same for Six Apart. But even as transparency in blogging increases communications and openness, the mega-egos of Steve Jobs, Bill Gates, Scott McNealy and Larry Ellison who ruled tech in the 1980s and 1990s are going to be less important, I believe. Sifry, as far as I am concerned, continues to do a great job marketing and promoting the service, above marketing himself. Technorati, despite its occasional bumps is still unparalleled in its capabilities, and I've particularly enjoyed some of the new widgets they released earlier this week, which you can see on this blog, from blog reaction tallies to a button displaying Web influence. So David, if you're still visiting and still reading, we wish you luck in the search, and hope that whichever direction the company takes, that you continue to promote great technology and innovation. For me, just about the only real benefit to using my Dell laptop at the office is access to Google Desktop and its thorough search capabilities through my six-year Outlook archive. If I've written the message or received it at any point, Google Desktop can find it for me quickly. For nearly everything else, I use the Mac. Now, it appears that after 30 months of neglect, Mac OS X users finally can get their hands on Google Desktop. While Apple highlights its integrated Spotlight search capability as part of Mac OS X, in reality, Spotlight is a program I try not to use all that often. It's slow, and doesn't present a Web-like interface in the way that Google Desktop does for Windows (or for the Web, of course). While we're installing the new program and indexing our hard drive, you can check out a pair of writeups from a pair of bloggers with early access, at Ars Technica and TUAW (The Unofficial Apple Weblog). TUAW also offers a screenshot gallery. To download, visit Google's Mac software downloads page. Turns out we were right. Not that I should be hired by Law and Order for my deduction skills, but it was indeed true that Technorati was planning a new release today, after I saw David Sifry's blog make updates in preparation. While it's not yet a state of the blogosphere, the blog search and tagging leader did update us on the company. Meanwhile, a new "State of the Live Web" will be posted by end of week. The new rundown, which can be found here, shows that the company is going "up and to the right" in its visitor growth, to 9 million unique visitors last month, up 141% quarter over quarter. The site also remains the most highly trafficked blog search engine, ahead of Google, Feedster and others. Sifry noted the updates in comments placed on this blog, saying "We have been doing a massive spam cleanup," adding "Thanks for noticing! I hope that you've seen a difference..."
Looking forward to the updates later this week. In the meantime, check out the summary, or take part in Robert Scoble's challenge - is Technorati still the best blog search engine in the land? Is a New Technorati State of the Blogosphere Coming? 4 minutes before midnight tonight, Dave Sifry, CEO of Technorati, posted a note that in one place, summarized the company's research into the state of the blogosphere. As the company famously tracks and tags more than 70 million blogs, they have become a real authority as to trends, growth and the sheer volume of information that is cranking out each day. Though there is no clear timetable to Technorati's updates, revisions to the "State of the Blogosphere" took place every two months in 2006, but the last was posted in October. Prior to 2006, there were three updates in 2005 and the inaugural October 2004 update. Sifry's quick archival of the posts also included the tags "sotb2007" and "solw2007", short for "State of the Blogosphere" and "State of the Live Web". As none have yet been posted, it suggests a new slew of facts will spill forth on continued blogosphere growth. In fact, his post is the only one in all of Technorati's database to contain such tags. I expect soon we will get more data that shows the rest of the blogosphere is going "Up and to the right". I've found that while I started the blog with a personal bent to cover everything from politics and technology to music and sports, it is the technology posts that are getting more than 90% of the attention, and recognizing that, I've made the adjustment, covering less about Bush and his rival Democrats, fewer daily updates on the Oakland A's or Sacramento Kings, and more focus on blogging trends, Google Reader, LinkedIn, YouTube, Apple, Technorati, and the blogosphere in general. As a result, visitors are gaining a better understanding of what they will find at louisgray.com. In a graph from SiteMeter showing the 30-day moving average of visitors to the site, the average, hovering in the 30s by end of February and 40s by beginning of March, has more than tripled, by the end of the month, crossing 50 by March 4, 75 by March 12, 100 by March 22, 125 by March 26, and up to 140 or so, where it is today. Some days, like when we wrote about the Apple TV debate being upside down, or gave 10 suggestions for Google Reader, saw more than 500 visitors. That raises the bar as far as what is expected of me, no doubt, if I am to sustain the momentum. I don't anticipate getting into the thousands of visitors a day, like a Scoble, GigaOM or TechCrunch, but I feel a lot better now that I'm no longer my number one audience. In fact, after a weekend that saw posts reach TechMeme no fewer than 3 times, I've had entrepreneurs e-mailing me their story ideas, in hopes I will cover their site or product on the blog. That's interesting. And just maybe I will. After all, having more than a month's worth of early beta access to Ballhype really helped me understand the value of the site. I was excited to learn late last night that Ballhype was ready to launch, and I told everyone I could today at the office that they should look into it. Am I an A-lister? Far from it. I'm not filled with self-delusion. But I hope I continue to post items that you find interesting, and that this spike of traffic we saw in March doesn't turn out to have been a fluke. We'll be working to keep the momentum going - up and to the right.